Iran removed seals on its nuclear facilities Tuesday, allowing work to resume despite warnings from the United States and other countries concerned about its nuclear ambitions. The United States and Britain rebuked Iran for the move, calling it a step toward creating the material for nuclear bombs. The United States is among nations that have called on Tehran to cease nuclear activities until an agreement has been reached on the scope of its nuclear program. Iran announced plans last weekto resume research on the production of nuclear fuel, heightening concerns that Tehran was moving toward building atomic weapons. Iran says the research is aimed at generating electricity. 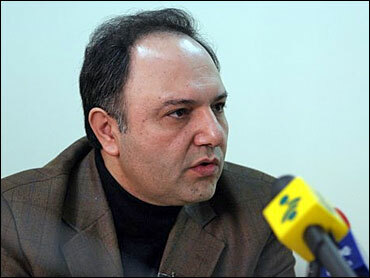 Mohammad Saeedi, the deputy head of Iran's Atomic Energy Organization, said Tuesday that Iran was not resuming the production of nuclear fuel, a process that would involve uranium enrichment. "What we resume is merely in the field of research, not more than that," he said at a news conference. "We make a difference between research on nuclear fuel technology and production of nuclear fuel." "Production of nuclear fuel remains suspended." Inspectors from the International Atomic Energy Agency affixed the seals more than two years ago after Iran agreed to the measure in an effort to dampen suspicions about its nuclear ambitions. IAEA inspectors were present Tuesday as Iranian officials began removing the seals, spokeswoman Melissa Fleming said from Vienna, Austria, where the agency is based. She declined to say whether the Iranians planned to start enriching uranium or would be satisfied with testing the equipment used in the process. In Vienna, the chief U.S. representative to the IAEA, Gregory L. Schulte, said that by cutting the seals, Iran had shown "its disdain for international concerns and its rejection of international diplomacy." "The regime continues to choose confrontation over cooperation, a choice that deepens the isolation of Iran and harms the interests of the Iranian people," he said. The White House says Iran has "shown it can not be trusted," CBS News radio correspondent Peter Maer reports. A spokesman said if Tehran continues down a path to uranium reprocessing or enhancement the matter will be referred to the U.N. Security Council. The United States has threatened to bring Iran before the U.N. Security Council for possible sanctions if it doesn't cooperate with international mediators. Russia, Iran's ally, also expressed concern about Tehran's intention to renew uranium enrichment activities and called on Iran to maintain its moratorium on enrichment pending negotiations, Russian news agencies reported. Earlier Tuesday, Deputy Foreign Minister Sergei Kislyak said that a Russian delegation had confirmed to Iranian officials that Moscow's offer to jointly enrich Iranian uranium on Russian territory still stands, the Interfax news agency reported. The proposal, backed by the European Union and the United States, was designed to ease concerns that Iran would use the fuel to build a bomb. Lavrov said Moscow was coordinating its actions with Germany, Britain and France, Interfax reported. Iran has insisted it would not agree to moving enrichment abroad. The British government said Tuesday it was very concerned, saying Iran's move would worsen a diplomatic impasse over the country's nuclear program. Prime Minister Tony Blair's official spokesman said the international community was "running out of patience" with Tehran. Britain's Foreign Secretary Jack Straw said Iran had again breached the U.N. nuclear watchdog's resolutions. "There was no good reason why Iran should have taken this step if its intentions are truly peaceful and it wanted to resolve long standing international concerns," Straw said in a statement. In a foreign policy address Tuesday, French President Jacques Chirac warned Iran it would be committing a "grave error" if it ignored the international community's repeated warnings and pressed ahead with its nuclear program. In Berlin on Monday, German Foreign Minister Frank-Walter Steinmeier said Iran was sending "very, very disastrous signals" on its nuclear program, and indicated that the country's latest moves would have consequences for Tehran's talks with European negotiators.